During Programme No. 6, from 7 November until 13 December, 2009, exhibition “Everything is Going to Be Alright” by the young and internationally renowned Dutch artist Guido van der Werve (1977) at the Kim? / VKN Gallery. In September 2009, van der Werve, who divides time among the Netherlands, the USA and Finland, visited Riga with a lecture on his development as an artist and his future plans. Now kim? has provided an opportunity to visit van der Werve’s exhibition. The exhibition has borrowed its name from the 2007 work “Nummer acht. Everything is going to be alright” exhibited in Manifesta 7, the European Biennial of Contemporary Art in 2008. 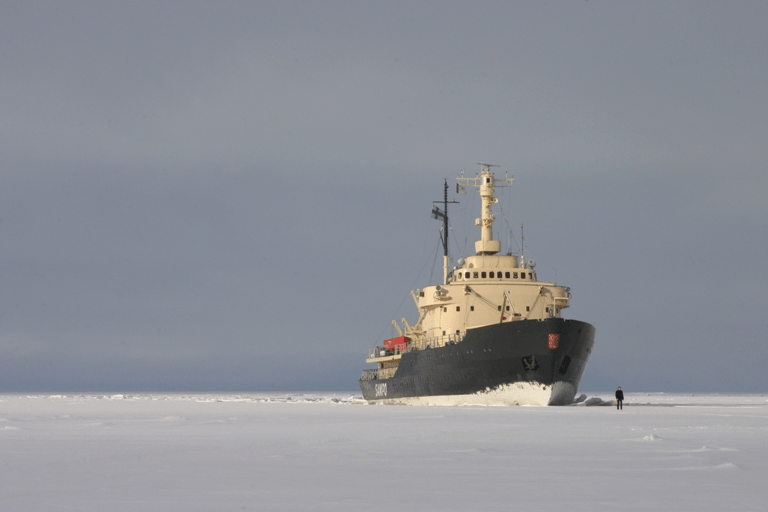 In this film, which Jessica Dawson from “The Washington Post” interprets as a metaphor for our journey through life, depicts the artist walking in front of the icebreaker “Sampo” in the harsh surroundings of the Gulf of Bothnia. Guido van der Werve’s works have been exhibited in many notable exhibition spaces in Berlin, London, Paris, New York ao. In 2009 his works are showcased in Das Weisse Haus, Vienna, Austria, L’Institut Néerlandais, Paris, France, Monitor Gallery, Rome, Italy, Marc Foxx Gallery, LA, the USA to name just a few.